Shimla, the capital of Himachal Pradesh, is one of India's most popular hill stations and is often referred to as the "Queen of the Hills". The town flourished during the reign of the British Empire. The British started flocking there in the 1820s when it was a nondescript village, and by 1864 it was declared to be their official summer capital. The Government of India stayed there for much of the year, only shifting to Kolkata (Calcutta) and later Delhi during the cold winter months. Hence, Shimla has an interesting history and distinct atmosphere of grandeur about it, with many well preserved historical buildings. From 50 houses in 1830, Shimla has grown to have a population of around 350,000 people now. The town stretches out along a ridge, making it perfect for exploration on foot. At one end is the Viceregal Lodge, and at the other end, the main square. The route passes through Shimla's Heritage Zone, where there are hundreds of prominent classic buildings and homes. Shimla Walks runs a special Heritage Zone Walking Tour. The tour lasts for 4-5 hours. It costs 3,000 rupees for one to four people, and 500 rupees for each additional person. It's possible to see Shimla by yourself but if you're interested in the town's history, a guide is invaluable. In this article, you'll discover some of the places covered on the walking tour. 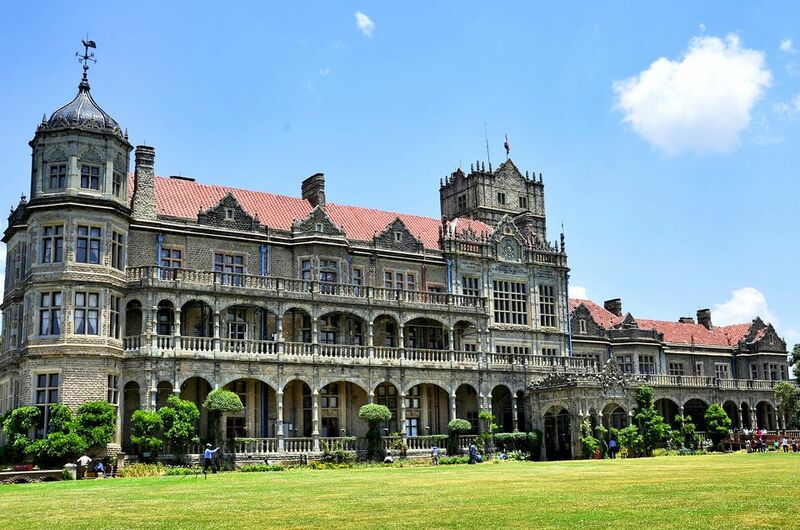 Located at the western end of the Ridge on Observatory Hill (one of the seven hills in Shimla), the gloriously Gothic Viceregal Lodge is Shimla's most impressive looking heritage building. Completed in 1888, it was designed by Irish-born architect Henry Irwin, whose other works include Mysore Palace and Chennai Railway Terminus.Only the best quality stone, carried all the way from Kalka by mules, was used in its construction. The Viceregal Lodge was built for Lord Dufferin, the Viceroy of India from 1884-1888, but he only ended up staying in it for a couple of months before being transferred. As well as lavish parties, a number of important discussions were held at the Lodge, including those that led to the partitioning of India and India's Independence. After Independence, the Lodge became the summer retreat of the President of India until it was decided to put it to academic use. It was transferred to the Ministry of Education and then handed over to the Indian Institute of Advanced Study, which still occupies it. The public is free to walk around the grounds and take a guided tour of designated rooms inside (unfortunately, the interior is nowhere as magnificent as the exterior though!). On display are many photographs, antiques, and other items dating back to the time of British rule. The building also has an interesting fire system. Wax-covered pipes are connected to water tanks. The heat of a fire will melt the wax and enable the flow of water to douse it. The Oberoi Group is known to have among the finest luxury hotels in India, and it all began at The Cecil in Shimla, on Mall Road. As with other prominent historical buildings in Shimla, its history is notable. The hotel was originally a modest single-storied house called Tendril Cottage, built in 1868. It was occupied by famous author Rudyard Kipling when he came to Shimla in 1883, and later developed as a hotel in 1902. Called Faletti’s Cecil Hotel, it was known as a landmark in Asia and "the finest hotel in the East". It was there that the founder of the Oberoi Group, the late Mr Rai Bahadur Mohan Singh Oberoi, came penniless to seek employment and his fortune in 1922. Apparently, he was thrown out of the hotel. However, instead of giving up, he waited many hours until the General Manager arrived and then asked him for a job. The General Manager appointed him as a front desk clerk because of his excellent grooming. Mr Oberoi rose through the ranks, displaying honesty, hard work and impressive business acumen. After managing the Clarkes Hotel for a while, the English owner was so pleased with his performance that he sold the hotel to him when he returned to England in 1934. Later, Mr Oberoi purchased shares in Associated Hotels of India, which owned The Cecil. He gained a controlling interest in the company in 1944 and became the first Indian to run the country's finest hotel chain. After being closed for extensive renovation in 1984, The Cecil reopened again in 1997. One of its features is Shimla's only temperature controlled swimming pool, with stunning valley views. The Himachal Pradesh Legislative Assembly is housed in what's known as The Council Chamber. One of the last important buildings constructed by the British, it was completed and inaugurated in 1925. The building changed hands many times after India's Independence, and part of it was even used to accommodate All India Radio. It was restored to its original function in 1963, when the Legislature was revived. This picturesque oval was originally the social playground of Shimla's blossoming British population. It came into existence in 1830, when there were around 600-800 Britishers living in Shimla, and it's where they held all their public events. The ground was named Annadale (now commonly misspelled as Annandale) by Captain Kennedy, who built the first double-story house in Shimla in 1922. Apparently, Anna is the name of a young lady he was attracted to in his youth. "Dale" means "valley". The ground was leased to the Indian Army in 1941 to be used for a training camp during World War II. However, control over the ground has become a serious point of contention between the Himachal Pradesh state government and the Indian Army, following the expiration of the Army's lease in 1982. These days, Annadale has an army museum (closed Mondays), golf course and helipad. The Shimla Railway Board building, constructed in 1896, was the first of its kind in India. Made predominantly out of cast iron and steel, it was designed to be resistant to fire. The materials were imported from Glasgow in Scotland and assembled by Richardson and Cruddas in Bombay (Mumbai). The building's safety-focused architecture did serve its purpose when a blaze broke out on the top floor in February 2001 and its structure wasn't damaged. The building currently house many government offices, including the police department. The hub of Shimla, the main square is where the Shimla Summer Festival is held in June. It's been a regular event since the 1960s. The most recognized landmark in the area is the cream-colored Christ Church. It was built in Elizabethan Neo-Gothic style and completed in 1857. It's the second oldest church in north India, with the oldest being Saint John's in Meerut (completed in 1821). The church's stained glass windows were designed, upon invitation, by Rudyard Kipling's father who was an acclaimed art teacher and illustrator. Also in the vicinity are the State Library with its mock Tudor architecture, Bandstand, Gaiety Theater, Town Hall and Scandal Point.